This entry was posted on July 21, 2015, in Coliseum Northside Hospital and tagged CEO Steve Daugherty, Coliseum Northside Hospital, community, Frozen, Frozen in July, H2U Health Center, Pediatrics, Steve's Weekly Wrap-Up, Town Hall. Bookmark the permalink. I have received several emails about when we will review the results of the employee survey that you took in May. This week we reviewed the hospital wide results with the Directors and outlined the process we will follow this year to review the results and get your feedback. Every department will be building an action plan to address areas where we can improve and those will be on your department meeting agenda’s for review and progress updates. In addition this year we will be asking your Director along with at least one staff member of their department to present your actions plan to the hospital leadership. We can all learn from each other as well as make sure we are all accountable to improving our hospital. The town hall meetings should be posted in your department and are listed on the blog (www.wearechs.com). . I am happy to tell you our overall results improved from 70 to 76 over last year! More detail at the town hall meetings. campus to enjoy the show as well as the special appearance from Elsa, Anna and others from Princess’s for a Cause. Please check out the photos on the blog and our Facebook page. We continue to build our reputation not only as a healthcare provider but a community member who gives back to those who honor us with providing their care. To the Marketing Team: Robin, Jennifer and Lindsey – BRAVO! Last week I attended the Georgia Hospital Association meeting along with Dr. Wayne Kelly, Vice Chairman of the Board for CHS. 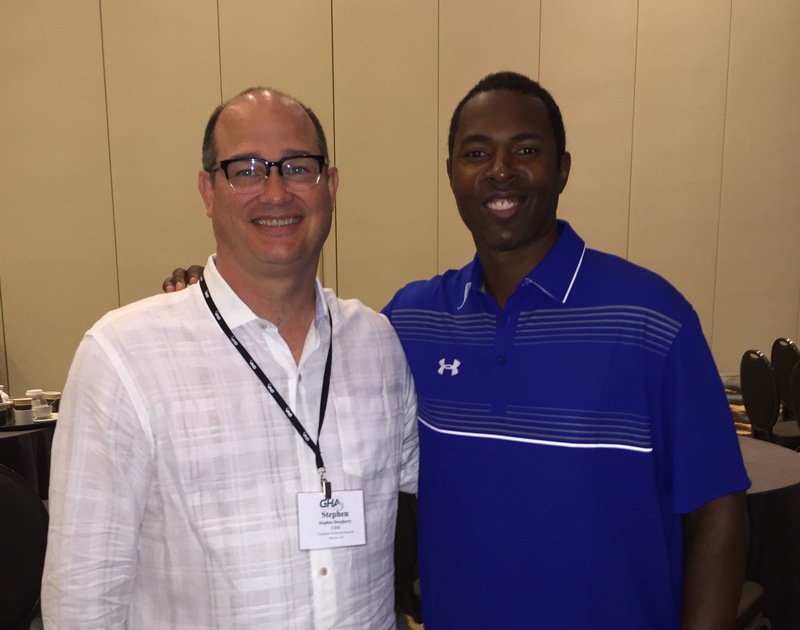 There were several great speakers one of which was Charlie Ward, former QB for the Florida State Seminoles, Heisman Trophy winner and NBA player. He delivered his message to us based on the 5 C’s outlined by John Maxwell. I found the first C, consistency, right in line with our patient experience journey. We all want and like consistency in our lives and our work. That is what our patients and physicians want in the care we provide them every day. Consistency in process provides a safer environment for our patients and helps ease their worries about what will happen next in the course of their plan of care. Consistency also gives us credibility since they know we will do what we say we will do for them. It gives them some certainty when their life seems out of control. Let’s work through our process to be as consistent as possible. I will be in Charleston for the rest of week for meetings with the other South Atlantic Division CEO’s, CMO’s and CFO’s. Thursday’s meeting is to discuss the evolving role of the Chief Medical Officer and leading a successful quality and medical staff office. On Friday the CEO’s and CFO’s are meeting to discuss service lines strategies as we enter into our business planning for 2016. I look forward to learning a lot from the presenters and my counterparts in the division. Last week we moved to the #1 spot in the South Atlantic Division as well as number 27 in HCA with an overall rating in the 69th percentile on inpatient care nationally. Our ER is solidly in 3rd place in the 73rd percentile just 2% away from the goal! Let’s continue to do great work and look for ways to provide excellent service to our patients and their families. Thanks for your hard work! Don’t forget about our $1500 employee referral bonus! We are still looking for great people to join our staff! School is just around the corner. Use a great benefit – H2U – for your school physicals, vaccinations and other back to school health checks. Its FREE!!!!! There is a link on our hospital intranet page to contact them to schedule an appointment or call (478) 464-0035 . “Kim and April treated me very kind. Very nice tech and nice nurse. My food was really good and I enjoyed my stay here at Coliseum Northside Hospital.” Patient – D.W. While receiving a much needed blood transfusion, my grandmother had a delayed immunologic reaction. Her nurse at the time, Blair, performed her duties perfectly and impressively. The nursing staff on the third floor have all been so very kind and helpful. I would like to give special applause to Drs. Monohan and Ellis for the time and attention they have given to make sure that the last days or years of an elderly woman’s life are lived according to her wishes. You should be very proud of your 3rd Floor staff!” Patient’s granddaughter – D.T. « August 2015 Town Hall Meetings!